Recover Rochester is celebrating a huge milestone, surpassing 75,000 lbs. of food donated to local families in need. 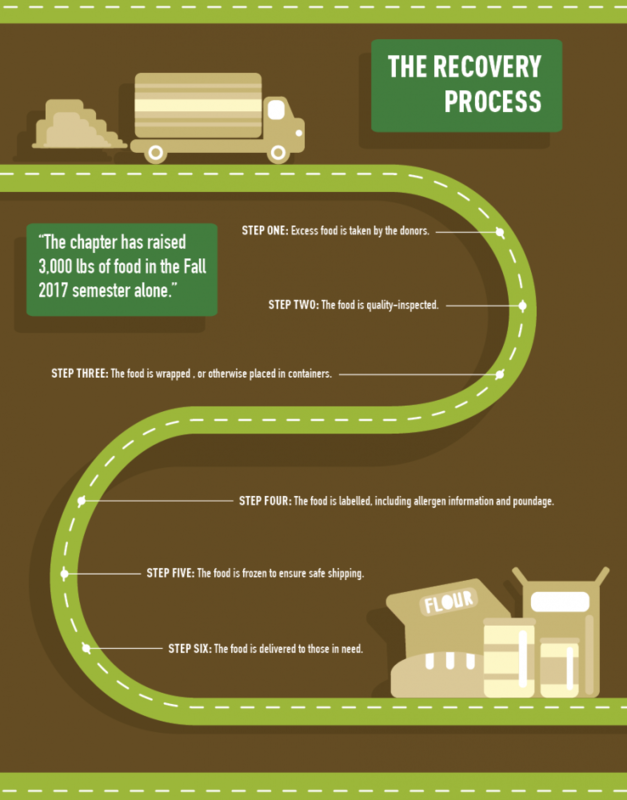 Recover Rochester began in December 2012 as one of 230 student-run university chapters of the Food Recovery Network, and is the oldest chapter in New York State. The organization works to salvage unused food from dining locations across campus and elsewhere, donating this food to churches, soup kitchens and similar establishments throughout the community. According to Corey Wrigley, a fifth year Industrial and Systems Engineering major and president of Recover Rochester, the chapter raised 3,000 lbs. of food in the Fall 2017 semester alone. Wrigley explains that they have worked heavily with other organizations, including the RIT FoodShare and the Student Environmental Action League (SEAL), to make the largest impact possible. Additionally, the organization relies on volunteers from the student body to sort and distribute the recovered food to those in most need. [Recover Rochester] has raised 3,000 lbs. of food in the Fall 2017 semester alone. The food itself comes mostly from RIT dining locations, including Brick City Cafe, Crossroads, Commons and Gracie’s. While the former three donate roughly 10–15 lbs. of food per week, Gracie’s will regularly donate between 80–100 lbs. This is in large part due to the high volume of students served at Gracie’s, as compared to other dining locations. Geoff Fasy, general manager of Gracie’s, claims the dining hall serves 3,000 individuals daily — a number unmatched by any other campus dining location. When looking to donate food, it must first be inspected to ensure it has not been contaminated, “double cooked” or otherwise compromised. The food is then preserved, wrapped, frozen and the ingredients and weight are listed to ensure Recover Rochester knows exactly what they are receiving and in what amount. Every week, Recover Rochester volunteers then come and pick up this donated food, distributing it to those in need. Many food locations monitor what they produce in order to ensure the food they donate is a healthy variety. “We’re just trying to help out the people that are less fortunate and we want to try to make it as well-balanced as we can for them,” Fasy said. Fasy admitted, however, that Gracie’s has reduced the volume of donations in recent months. He claims that Gracie’s has been looking to reduce the overall amount of food produced in an effort to better meet demand without creating vast excess. Fasy further explained that, in addition to Gracie’s’ food donations, they “are also doing [their] own due diligence to save and [to] respect the costs that are associated with RIT.” Fasy is balancing the desire to make a positive impact on families in need while also keeping costs to a minimum for their own student body. Wrigley and Recover Rochester greatly appreciate their help. In no small part due to the efforts of Fasy and the entire Gracie’s staff, Recover Rochester has been able to provide 57,750 meals to the Rochester community in the five years since its founding, cementing itself as a positive influence on the Rochester community. The chapter has also been more than willing to help the movement grow and expand to surrounding schools. Wrigley notes that other, newer chapters of the Food Recovery Network have shadowed Recover Rochester’s operations, learning from them and improving their own efficiency and outreach. Wrigley and other Recover Rochester representatives have also corresponded with their peers, sharing their experiences and offering tips going forward. Specifically, Wrigley mentions working with St. John Fisher College and the University of Rochester, aiding their fledgling operations and learning a few things from them in return. Recover Rochester has been able to provide 57,750 meals to the Rochester community in the five years since its founding, cementing itself as a positive influence on the Rochester community. Now, Recover Rochester is focusing on raising awareness of both their campaign and the issue of food safety in general. Through the utilization of movies and events, as well as partnering with other clubs and organizations around campus, Wrigley and previous presidents have consistently worked to increase involvement and foster a general understanding of the food security issue both locally and beyond. “The more people that know about [food security], the more conversations can happen and the more people ... can reach out and really get involved to make a change,” Wrigley said. Despite reaching the 75,000 lbs. milestone, Wrigley firmly believes that his work is never done. There will always be hungry mouths to feed, and Recover Rochester will continue doing just that. However, he’d like to remind others that “it takes a lot of people to make a difference, it can’t just be a one-person job.” Wrigley encourages everyone to go out and donate their excess food, rather than let it go to waste. It may have no value to one individual, but it could mean the world to someone else.